Jona Friedman began writing freelance articles for the "Sacramento Bee" in 2009. She has been a personal trainer for over nine years and holds a Bachelor of Science in exercise science from Long Beach State University. She has worked for California Family Fitness, Bally Total Fitness and Golds Gym. She is also a NASM-certified personal trainer. Scarring is a common side effect after most types of surgeries. 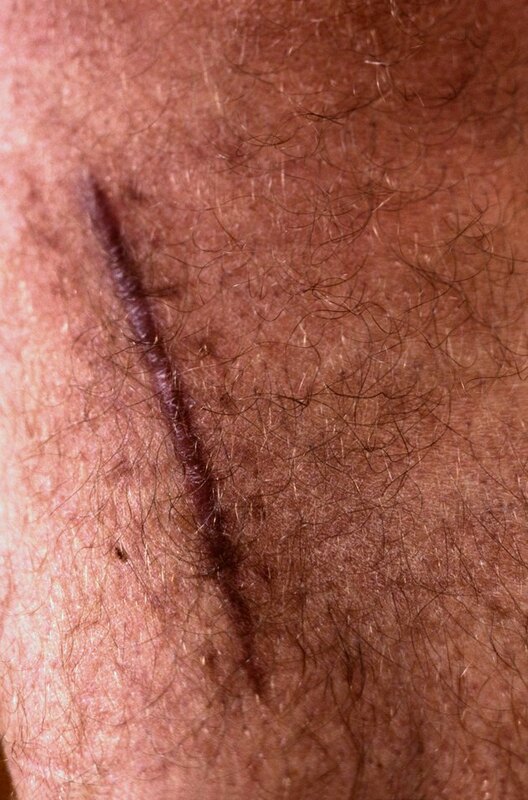 Scars often occur because of the fibrous tissue that forms over the wound as it heals. Some individuals are more predisposed to painful scarring than others. However, there are many different treatment options for a sore surgical scar. Be sure to consult your doctor before treating the affected area yourself. Mild to moderate physical activity may be beneficial for a sore surgical scar, depending on the area where the procedure took place. This improves blood flow to the area, which can speed healing time. However, intense activity is discouraged if it causes pain at the site of the scar. Be sure your wound is properly bandaged and dressed. If it is an open wound, it may be susceptible to bacterial infection if it is not covered. As your surgeon about any special dressings that may help your wound heal more quickly, prevent further scarring and diminish pain. Depending on the type of surgery, your doctor may have prescribed a prescription medication to help alleviate pain at the surgical site. Be sure to follow the instructions and utilize all medicine prescribed to you. Consult your physician about greater dosages if the pain continues. If the pain is mild, you can often use an over-the-counter, or OTC, treatment. An analgesic cream can often alleviate painful scars. Also, cocoa butter and Vitamin E lotions and creams can help diminish the appearance of the scar. Talk to your doctor first before using any OTC creams. Non-steroidal anti-inflammatory drugs, or NSAIDs, may help mitigate pain often associated with surgical scars. Aspirin and ibuprofen are the most common NSAIDs. Take only as directed by your physician.